Update on the above post. I'm sad to report that E's experiment with me helping did not work. Apparently I felt the pain of the animals that were being abused too much and couldn't continue. I've spoken to her more about this and she's given permission to pass on what she told me here. It seems that the Elementals don't feel the pain of living creatures like we do. They experience their pain as "stress in the energy field" and the larger the animal the greater the impact on the field. Makes sense. How could they do their work otherwise. But they must feel this constantly as animals, etc die all over the World everyday. Why does it bother them that humans somewhere are hurting and killing animals brutally? Apparently the stress is different then. She says the energy is "dirty". And that comes from the energy of the human who is doing the harm. They feel the disharmony in it re the pattern and it comes from the "intent" in the human. So why doesn't the 'normal' death of animals bother them? E says, "In, out, no different. The being in still the same." Apparently they apply this logic to humans as well and see it as merely a choice for us as to whether we stay 'in' or 'out' of physical manifestation. As regards humans feeling the pain, she told me that the energy of the animal's pain "pierces" my Soul, and that is destructive as it damages and breaks it down. She says our Souls are different energy, describing it as "deeper" and "more organized"..."different matter" or "organization of materials". She's finding it hard to explain but that's how they percieve it apparently. Knowing that animals are being abused every day I asked her why that doesn't effect our Soul's energy as well. One would think if it has that destructive effect that we would all be severely damaged. And she says that we do feel it. It impinges on our auras and makes us sad but witnessing it lets it in to our hearts, "goes deep". E sees the whole process as boiling down to "survival" of our "species" and of us being "caretakers" and "dominators" of the Earth system, so it becomes our "responsibility to know and care" re what our fellowman is doing here. We need all to evolve "as is said. Our Law for all together in Time." And now, "Enough." It follows on, doesn't it, that this imbalanced state in those humans who have the lust to hurt and dominate those who are weaker, like animals and children, does effect us all and that it is our responsibility as a whole to put a stop to it. If we didn't feel the effect of this imbalance so strongly ie as pain, we'd probably do nothing about it. "See? Easy," E just said. That just gave me another thought........We humans are so 'dense' that we need stronger 'wake-up' calls (pain) to bring us back to a 'less dense' state of being, aka 5D, haha. Now because of my involvement in animal welfare programs, I know there is a belief in some Asian countries that if an animal is filled with fear when dying that the meat is more tender, which is why they torture them to death. (I know, ) We also know that cooks tenderize meat by using a tenderizing mallet to break it up or by using marinades or powders that are acidic to "denature" or unwind the long proteins in the muscle. But "piercing" the meat, in either way, is what does the trick basically. And E said that feeling another's pain has a "piercing" effect on us, breaking up our Souls. And we all know that feeling pain causes fear. And that the 'dark' ETs supposedly love the energy of fear, promoting it in us to feed on it. E also said they percieve this obnoxious lust to dominate by inflicting pain as "dirty" energy that creates stress in the energy field so, to me, that brings it all back to the will to individually dominate others as being the most destructive energetic in the Universe. Either way you look at it, being 'pierced' allows any being to be more easily fed on, energetically and physically. And it follows from there that the will of one to dominate us is the basis of all fear AND pain. So is it any wonder that those of us who are group orientated, evolving into integration the same as Elementals do, will fight any being or government that seeks to dominate? I know, it's an old theme, but it amazes me how E's perceptions illustrate and bring it all together like this. And her explantion of how Elementals view it proves that ALL life knows this it seems. Now I want to post a link to a wonderful thread that SiriArc introduced me to on the Noble Realms forum. The lovely lady who started it, Lipstick Mystic, is clearly clairvoyant and has personal dealings with and understanding of the Elemental Realms and a lot of what she's learned can be found on this thread. But another reason I'm posting the link here is because she also writes about dragons, one of whom is a guide of sorts for her. There seems to be a lot of negative feeling and misunderstanding about dragons on this forum so I want to post some of what she's said about them here and hopefully those interested will use the link to find out more themselves, and more about the Elemental realms in the process. I do hope Lipstick Mystic does not mind me doing this. I'm still inching my way up to talking more about the dragons. They're real, and they're not the same as the negative reptilian bipedal ET's we so famously chat about here. And there is power in dragon fire. Healing power. Passion power. Love power. There are also real physical dragons still here on this planet - and the others are in the etheric operating like elemental beings, helpful for aiding you with manifestation, communication, healing, and more. My dragon is a red dragon. He's breathed healing fire into me many times and helped me out. He also loves jazz music, and he has a very playful and joyful energy. I tune into him from time to time as one of my spiritual helpers. He has told me a lot about the dragon realms. Wild stuff. Their culture honors a female mother dragon as "goddess," so they honor female energy very powerfully. This is different from the humanoid or shapeshifting lizard crowd, who are also extremely diverse and run the gamut from scientific/kind and good lizzies who look more like amphibians to extremely Luciferian and warlike races who conspire with demons to enslave humanity to species in between. Complex stuff. But very fascinating. There are negative dragonic energies which can be wrapped around the spine in a partial possession - I've worked on pulling those out of myself and others. And then there are positive dragon energies who are more like creative guides or healing helpers who LOVE to teach humanity about "magic", power prayer, mind over matter, and the use of the mind/emotions to build positive new realities on this planet. The dragons are very "elemental" in that they seem deeply linked to nature. They always identify themselves to me through natural elements. This one in the woods that we talked to was clear that he was a "rock dragon." The one that that woman saw in Banff gave her a clear impression that it was associated with the forest as a forest dragon. Since then I've also communicated with wyverns, which are a type of dragon without wings, and the wyverns I've communicated with in meditation have always been associated with water. I've found them watching over waterfalls and sacred streams and lakes. Again, they seem to not be in 3D exactly, yet they aren't entirely nonphysical, either. Somehow, they operate much like the elementals talked about in the magical traditions - like the sylphs, ondines, gnomes and salamanders, only they are NOT the same creatures. When you put an ondine next to a wyvern (water dragon,) they are distinctly different beings. They have a friendly inter-relationship, but they are not the same beings. This ties into feng shui, "dragon lines" or ley lines of the ancient Chinese traditions, and the Chinese approach to dragons. I believe that Chinese seers or mystics must have been able to "see" the dragonic energies linked to various sacred nature spots and that the entire system of "dragon lines" or ley line understanding must come from things the dragons taught them. The dragons I've communicated with have almost all been loving, kind, and powerful. But interestingly enough, many of them have warned me about black dragons - these dragons are apparently associated with death and chaos and are not good to associate with. MANY different dragons have independently warned me about them. Interesting how the martial arts traditions are often bound into using the symbolism of the black dragon - master of death, inciter of chaos as an agent for change. There was one REAL black dragon associated with a holistic health teacher I studied with. It was part of this man's "spiritual posse," an attached entity. Others could see this in his aura, not just me. It was independently confirmed. And this dragon energy was dark, evil, and very much read like a "killer." So....we quickly learned to claim the workshop space we were using "for God" (for peaceful, loving energy) and set up a barrier so that the teacher could enter the space, but his black dragon guide couldn't! And after that the students weren't getting attacked by this thing anymore. I'd had some bad psychic attack from that being before I got smart about setting up a shield against it. So....I'm not sure if black dragons manifest the way my rock dragon pal did, in a 3.5 dimensional form, but I can say that there are a certain amount of metaphysical teachers out there (especially Asian ones, I've found) who for some reason have this black dragon energy in their field, and it's very ancient and ties back to some old Asian warrior cults who pledged spiritual service to the black dragon energies in exchange for protection. Again, here is the link if you'd like to read more. I found doing so an absolute delight. Thanks again for this link SiriArc. Sanicle, what a find. Thanks for posting. And this just proves once again that no matter what we do when dealing with all kind of spiritual and advanced entities, setting your own shield should be a priority number one before even starting. To be succinct - The Dragons that are Negative in Nature here are Renegades and even Their own Genus is attempting to deal with the Problems these Negative Dracos have Created. malletzky wrote: Sanicle, what a find. Thanks for posting. And this just proves once again that no matter what we do when dealing with all kind of spiritual and advanced entities, setting your own shield should be a priority number one before even starting. Thanks Malletzky. It's my great pleasure to post this link as the whole thread is worth reading. To me it's a treasure trove as all those fine minds discuss what Lipstick Mystic reveals to them of her experiences. And I couldn't agree more about the shielding. Actually the Elementals have provided me with an extra shield also....a square shaped one with a four-petalled flower imprinted on it that covers my heart chakra. I've seen it there for about the last two weeks. They really do care and do all they can to help me and protect me while in their realm. I couldn't agree more Mercuriel. So many deal in absolutes and you just can't, can you. I'm actually being shown how some of what you've said manifests in the Elemental Realms at present and it's a real education to see how cleverly they deal with such things. Iceland: It lies at the pinnacle of the spine of the earth — the Mid-Atlantic Ridge — the rift in the crust of the earth through which magma flows out into the cold sea with such unimaginable force that it pushes the continents of the world apart. Here the extremes are stunning, for this is the land of Fire and Ice. Numerous active volcanoes rise and smoke and erupt. Hundreds of geysers and some 800 hot springs release the energies of the fires of the earth. Great glaciers slide along the bedrock, and snows cover the land, so close to the Arctic circle, in the freezing winters. In the spring, their meltwaters feed Iceland's 10,000 plunging waterfalls. Then in the warm months the landscape is painted with wildflowers. The winter skies dance with the Aurora Borealis, the electromagnetic light show of brilliant blues and greens. But this is not just a place of extraordinary splendor and stunning beauty. This is a Magic Land, a land of Myth and Legend — of gnome and faerie, elf and troll. This is the home of the Huldufolk, the "Hidden Folk" who co-inhabit the land, and to whom respect is paid and room is provided. This is the mystical world of which the Icelandic bards spoke in the great epics and sagas, the Edda and the Prose Edda that tell the tales of the Völuspá, the vision of the Seeress, and relate the Hávamál, the speeches of the High One. Here the worlds of fire and ice come close to each other, and here human and faerie share a magical space. Iceland may be the only place in the world where people redraw the map of a road to prevent disturbing faerie property and have an Elf School dedicated to preserving the lore of the Hidden Folk. Lazaris has drawn us to many magical places where the Earth loves herself: the soft, rolling Blue Ridge Mountains, the deep, blue Lake Tahoe, and Yosemite, the temple of the earth. And he has enchanted us with the places where the faerie world is close to us: Maui, Hawaii and The Lake District in England. This workshop will be a combination of a Congress of Magicians and an Intensive. There will be discussions, rituals, meditations, and Magic Times. There will be two Private Magic Days or free days to explore Iceland. These days are designed for you to work your magic with friends and fellow magicians as you connect with the land and the magic of this enchanting place. Each participant will receive a crystal and a special talisman during the Crystal Ceremony Time. This island at the top of the world is a place of both stunning nature — and its Nature Spirits — and a place where the Celts dwelled and the Hidden Folk touch the human world. Thank you for posting this SiriArc. It's so great to know the Icelanders are giving them the respect they deserve and that others who will attend this workshop will too. What a wonderful place that would be to visit! It would also appear that we have one of those Agents in our "mists". I'm with you Sanicle. Well spoken. Consider me a little late or behind the 8 ball but you are wise. All the banter of one little hen? Not worth wasting all that time to just deal with an Agent of chaos. Thanks for the kind words Lionhawk, but clearly not wise enough to know how to heal the fear in self-destructive little hens. The process of the creation of humanity was programmed first through genetics by the beings who transmute the genetic information and evolution. These are the Beings we call Eternal Beings or Nature Spirits. These Beings project all the forms that emanate from God in the physical worlds. that they, like the kingdom of heaven, are within. My contact with the devas opened up in a natural way, rising organically from my life background. My two brothers and I were brought up by the most delightful and loving parents in a beautiful old house next to a wood in Canada. We had gardens of vegetables and flowers, but I was not especially attracted to cultivated plants. I loved wandering in the wild places. I went to university with a lot of questions, but despite all the talk about the profundities of life, I found no satisfactory answers. Eventually I started paying attention to that voice within that had long been asking me to listen, and I began to write down the daily guidance I was receiving. During a period of spiritual training which was teaching me to place the will of this indwelling God first in my life, I met Peter and Eileen Caddy. Before moving to Findhorn, we worked together on the staff of the hotel where Peter was manager, putting this principle into action. When I speak of God's will, I am aware that this might call up a stereotyped picture of an old gentleman somewhere out in the sky, making automatons of us by imposing an external will. This is not my meaning, but I do not know of another way in which to convey it. To me. God is an indwelling presence, the core of what I am and what everything is. God is life itself, speaking through all life. And God's will is the path we tread which develops the best for us and for all we encounter. Let My will be a mystery for you to find in each moment, my guidance told me. Seek it within the little and the big. It includes all people and all things, all questions and all answers. Our first winter at Findhorn had been an especially harsh one for the area, with frequent gale-force winds adding to the snow and rain. But by early May, 1963, the first radishes and lettuce Peter had sown in the patio garden were coming up, and he was busy preparing another area for peas and beans and a few other vegetables. The spring weather was growing warm enough for us to sit outside on the patio during our daily time of quiet together. This was a delightful opportunity to experience God's presence in everything around me. "One of the jobs for you as My free child is to feel into the nature forces, such as the wind. Feel its essence and purpose for Me, and be positive and harmonize with that essence. It will not be as difficult as you immediately imagine because the beings of these forces will be glad to feel a friendly power. All forces are to be felt into, even the sun, the moon, the sea, the trees, the very grass. All are part of My life. All is one life. Play your part in making life one again, with My help." Well, I thought that was very nice, because as far as I was concerned, there was nothing I would like better than to sit in the sun and commune with nature. But when Peter saw this guidance, that's not how he understood it. "You can use that to help with the garden!" he said, feeling that direct contact with the nature forces might give him the answers he needed to his questions about the garden. Sure enough, the next day I was told in guidance. "Yes, you are to cooperate in the garden. Begin this by thinking about the nature spirits, the higher over lighting nature spirits, and tune into them. That will be so unusual as to draw their interest here. They will be overjoyed to find some members of the human race eager for their help. That is the first step". "By the higher nature spirits, I mean those such as the spirits of clouds, of rain, and of vegetables. The smaller individual nature spirits are under their jurisdiction. In the new world these realms will be quite open to humans... or I should say, humans will be open to them. " "Seek into the glorious realms of nature with sympathy and understanding, knowing that these beings are of the Light, willing to help, but suspicious of humans and on the lookout for the false, the snags. Keep with Me and they will find none, and you will all build towards the new." I thought such instructions rather a tall order, taxing my credulity and certainly beyond my talents. I knew only a little about nature spirits and, although I was aware of the angelic hierarchy, I had not known that there were devas overlighting vegetables. I told Peter I couldn't do it and stalled for several weeks, despite his encouragement. However, instructions from the inner divinity... and Peter's promptings... are not lightly disregarded! "I can speak to you, human. I am entirely directed by my work which is set out and molded and which I merely bring to fruition, yet you have come straight to my awareness. My work is clear before me... to bring the force fields into manifestation regardless of obstacles, and there are many in this man-infested world. While the vegetable kingdom holds no grudge against those it feeds, man takes what be can as a matter of course, giving no thanks. This makes us strangely hostile." "What I would tell you is that as we forge ahead, never deviating from our course for one moment's thought, feeling or action, so could you. Humans generally seem not to know where they are going or why. If they did, what a powerhouse they would be. If they were on the straight course of what is to be done, we could cooperate with them! I have put across my meaning and bid you farewell." At this point I might say that the term "deva" is a Sanskrit word meaning shining one. On the whole, I have chosen to use this word rather than the English equivalent, "angel," which calls up stereotyped images that are more of a barrier than a help in understanding the true nature of these beings. It wasn't until nearly ten years later that I was introduced to some of the esoteric literature on devas. However, through my own contact with them we discovered that they are part of a whole hierarchy of beings, from the earthiest gnome to the highest archangel, and are a sister evolution to the human on earth. The devas hold the archetypal pattern and plan for all forms around us, and they direct the energy needed for materializing them. The physical bodies of minerals, vegetables, animals and humans are all energy brought into form through the work of the devic kingdom. Sometimes we call that work natural law, but it is the devas who carry out that law, ceaselessly and joyfully. The level of this hierarchy I was guided to contact was not that of the spirit of, say, a particular pea plant in our garden, but rather the overlighting intelligence, the soul essence, of all peas throughout the world. While the devas might be considered the "architects" of plant forms, the nature spirits or elementals, such as gnomes and fairies, may be seen as the "craftsmen," using the blueprint and energy channeled to them by the devas to build up the plant form. It was with these beings that R. Ogilvie Crombie established communication. When Roc joined our work at Findhorn, he helped to clarify and confirm certain undefined feelings I had had about the plant world. For instance, while I could not explain why I was upset when the gorse bushes were pruned in full blossom. Roc was able to clarify exactly what was wrong through his contact with the nature spirits. Essentially, the devas are energy, they are life force. (We humans are as well, only in our own unique way.) I was told in guidance: "You are simply surrounded by life. You are a life force moving along with other life forces. As you recognize this, you open up and draw near to these others, becoming more and more one with them, working together for My purposes." The devas themselves have no particular form. But in attempting to establish communication and cooperation with humans, members of the devic realms have made themselves visible in a form intelligible to humans. These forms reflect their functions. For instance, a dwarf is usually depicted with a pickaxe, denoting our human interpretation of his work with the mineral world. Angels, on the other hand, are portrayed with wings, and often as bearing something, such as a message of healing or mercy. As the devas have said: "We work in the formless worlds and are not bound or rigid in form as you are. We travel from realm to realm and are given wings to denote this movement. As we travel, our form changes, taking on the qualities of different realms. Therefore, you cannot pin us down to any one form. We deal directly with energy and that energy shapes us, is part of us, is us, until we breathe it out to where it is needed. We are limitless, free, and insubstantial." I have never seen any of these beings in a definite form, although sometimes I get an impression of a pattern, a shape or a color. Once when I had the image of the Red Cabbage Deva standing in front of many vague forms, I was told: "These forms are myself and those like me as we have been and as we shall be. Although we live in the moment and are always moving, yet is our past and present with us. We are close to the inner realms where all is living. I give you this picture so that you will not see me, or any of us, as merely one of a list of static forms but will connect us up more with life. Humans are so inclined to limit and depend upon their five senses to perceive the world that they forget that we are living, changing forces now, outside your sense of time." As we became more aware of the fact that everything around us is part of the same energy in different forms, we were opened up to an entirely new way of working in the garden. The devas said, "We realize it is easy for man to think of a plant as a thing, perhaps as living, but nevertheless a thing, for he cuts himself off from the vision that sees beyond the physical, just as he cuts himself off from his own inner being which is so vast." Taking into account the inner being of plants, we began to realize that the garden must be known from within as well as from without, that it must grow spiritually as well as physically. To a deva, the garden is not an assembly of various forms and colors but rather moving lines of energy. In describing our garden they said they could see the forces from below gradually being drawn up and blending with those coming down from them in great, swift waves. Within this field of energy, each plant was an individual whirlpool of activity. "We do not see things as you do, in their solid, outer materializations, but rather in their inner life-giving state. We deal with what is behind what you see or sense, but these are interconnected, like different octaves of the same melody. What we see is different forms of light." Years later, when I read about Kirlian photography, which records the luminescence given off by matter, I felt this related to the subtler forces of which the devas speak. The devas stressed the importance of our learning to see the true reality, as they do, so that we might with the power of our directed thought not only affirm the perfection of each plant but actually lift it to a higher level. "By thinking in terms of light, you add light to that already existing. Hence, you speed up growth and enhance beauty, you see truth and link up with God's perfection." The intention of the devas in introducing us to their way of seeing was not to detract from .the beauty of the world as seen by human eyes, but to enhance it by expanding our awareness into a broader and truer perception. In time, we learned that thinking in this way was indeed a practical way of working in the garden. But at first, being wise teachers, the devas responded to what was most obviously vital to .us at the moment... the actual physical needs of the garden, only gradually introducing us to this new perception. They gave us specific advice, for instance, on how far apart plants should be or where to place them. "We think that the land on the top there would be a good site for us, as long as it is not too windy." The Globe Artichoke Deva advised. The Cabbage Deva suggested. It would be better to thin out the plants now. A/so taking off those lower leaves will be alright. In springtime, the Blackcurrant Deva told us. "No, don't cut the plants back now. The root would not be strengthened if you did; it needs the leaves to make the process of life go through the plant." We used to gather sheep dung from a nearby field to make a liquid fertilizer. "Liquid manure is a great medium for certain ranges of forces, because liquid attracts and gathers in certain subtle forces which cannot enter into a more solid medium, a deva informed us, and advised. The strength is about right, although for certain plants it could be a little stronger." I used to do regular rounds with the liquid manure, asking each vegetable deva whether or not the plants would like a dose that day. Sometimes the response was just a direct Yes or No, while at other times it was combined with a bit of general information. Asking the Tomato Deva about nutrients, I got. "You can give the plant liquid manure now. We will not let all the goodness of it be used for developing leaves. When there is cooperation between us like this, we can give instructions to the plant that it is the fruit which is to be developed." The Carrot Deva told us. The carrots are coming along nicely and could be missed when you put on another dose of liquid manure. You wonder why they are alright when the parsnips next to them are hungry. The carrots, through their special carrot quality, are able to convert energy from the radiations which parsnips do not tune into. The soil, of course, was one of the areas of our garden that received a great deal of attention. In transforming sand into soil, we were re-enacting the natural process of creation on our planet by drawing together the ingredients necessary to sustain life. The day following my first contact with the Pea Deva, I was told in guidance that we could ask questions about the soil from a certain being overlighting our geographical area. We were told that the magnetism of this angel and the magnetism of the land around us were linked and interacted. For want of a better name, we called this being the Landscape Angel. I got an initial impression of it with "hands" outstretched, passing energy into the ground. "You can see me juggling the life forces into the garden and never ceasing the movement. We work in what you call mantras, in movements, which produce sound and make a pattern, working up to a certain pitch. By these moves, I am now putting a certain quality of life force into the garden. There are many irregularities in the composition of the soil and by adding these explosions of forces, they are being minimized." For about two years, we were given almost daily guidance from the Landscape Angel on how to build compost and enrich the soil. For instance, we were told. "You have a real difficulty with that soil which does need more air but which would blow away if you loosened it. If possible, hoe it before a rain and loosen it before spreading compost on it." "It would be good to turn the remainder of that first compost heap, but the other one is not quite ready for turning... a week or so, and then start building the others. We can tell by the degree of radiance that the one heap needs attention... it has dulled down. The others are still building up to the point where they should be moved." Spreading compost throughout the garden brought the whole area into greater unity. "It is a binding, uniting process, like the circulation of the blood in the body." Our ignorance in these areas is obvious to any gardener, but because of it we were able to accept the advice we received from the devas, see the successful results, and then open ourselves to what they had to teach us further about life. However, working in cooperation with humans was pioneering for the devas as well, and so they could not always foresee what would happen in the garden. Our first season, the broad beans started out in an energetic flowering, but then the blossoms began falling off. When I asked the deva why this was happening, I received. "To tell the truth, we threw ourselves fully into our cooperation with you and did not allow for the quality of the soil. The shot in the arm given us through your collaboration shot us ahead too fast! So we are balancing up this way. We have no regrets; it was well worth trying." They were always willing to experiment. I think this was sometimes done so that we would learn the true effects of certain actions and gardening practices.In our garden, they did not feel limited, and they could see the creative power of humans, so they wanted to show what could be done with their cooperation. A wonderful example of this was our work with the Watercress Deva. Various gardening books were sharply divided on how to grow watercress. While one said it could not be done without running water, another said it could if grown in the shade, and yet a third advised growing it in the sun. Unsure of what to do, Peter asked me to contact the deva, who suggested that we experiment by growing half in the shade and half in the sun. This proved wise advice because, with daily watering, the plants in the sun grew quickly, providing us with watercress throughout the summer and then went to seed just as the plants in the shade were ready for picking in late summer and autumn. It delighted the devas when Peter acted on their suggestions. While at the beginning of our contact they had seemed rather remote, our cooperation changed that, and they became friendly and even anxious to help. In fact, we were told that they were practically queueing up to experience this new contact with human life. They said that the few contacts made with Western man in the past had not usually been happy ones, except for those made by gardeners who truly loved plants. Contacts had also been made to bring about new plant forms, yet the horticultural experts who were responsible for these innovations had not always worked with the nature forces as equal partners but sometimes imposed their will on nature, making it respond to their designs. So although the devas welcomed our questions as a means to bring about understanding and true cooperation between us, what interested them most was the process by which a human... deaf,dumb and blind in their regions... was reaching out to know them and talk to them. Both in the guidance Eileen received and in messages from the devas, we were told to grow as many varieties in our garden as possible. Besides producing a better balance in the soil, a large variety of plants focused the forces of more devas. That in turn attracted the great overlighting devas who could use the garden to serve a certain purpose on the planet. Peter was ordering vegetables and herbs we had not seen or heard of until the nursery catalogues brought them to our notice... plants with strange names like celeriac, salsify and scorzonera, kohlrabi and cardoon, soapwort and sweet cicely. The herbs we ordered were sent to us by rail, beautifully packed in moss and cellophane and we carefully planted them out in our garden. As they grew, we discovered that sweet cicely was one of the commonest roadside "weeds" in the area! As Peter brought each new plant into the garden, I welcomed the deva of its species. I found each had a unique feeling and quality. The Radish Deva, who has always been especially active in the garden at Findhorn, responded to my welcome with. "We swoop in again, delighted to spread ourselves. We are in a great hurry it seems to you. Our forces give the impression of eager beavers. We are that, but with hearts too!" The Angelica Deva on the other hand was a bit more hesitant: "We come in quietly, intent on our small world. To be asked to speak is unusual, to say the least, but you feel our influence and we hope that the particular quality with which you respond to us will be greatly strengthened here. Thus is our mission on Earth fulfilled." Most often the devas exhibited a quality of exuberance and vitality, as did the Marrow Deva: "We are delighted to be given so much space and should like to be able to throw great hefty marrows straight into your laps! But if we did that, we should not daily be making use of the available forces given us for growth through nature and man. The growing process is a great blessing in itself. It is creation, and perhaps it is difficult at times, but everything is used for that purpose and the greater good. We are glad to be a part of it, glad to grow for you. " When we decided to grow dandelions as a vegetable, the deva responded, "I am greatly honored to come into the garden by the front door! It does make a difference in the bond between us and man when we come at his desire instead of in spite of him, for with his aid the struggle is not so great and the plant can expand and do it's best. Let us show what we can do in cooperation. Nevertheless, I hope to be greeting you from odd corners. Cooperation indeed made a vast difference, because the dandelions we welcomed in grew to a relatively great size." I find that I have to know something of a new plant before being able to contact the deva. Often I would read about the characteristics of a plant... sometimes taste a bit of it. This was not always an enjoyable encounter! Sampling a wormwood leaf, I was quite taken aback by the strength of its flavor, and I can't say I would recommend the experience. The deva responded. "You are amazed that such a strong taste can be contained in such a little bit of leaf. Power is our nature... a little root can crack rocks. Power can be used for many purposes. You humans also have power. Yet power is a word which many people shy away from because in human hands it can be used for evil. Power is said to corrupt. We view it in another light entirely. We consider it the greatest gift of God because with it we can do more for God than without it. It is our joy to perfect that power in service. Because the herb devas concentrate all their energy in expressing one particular essence, the flavors of these plants are very distinct." I found the herb devas especially amenable to contact with humans. "Plants such as us, the herbs, have long associations with humans and are thus ready to be leaders in the cooperation between our two worlds. We are part of human consciousness. You have discovered much about us and we can easily dance into your awareness. But remember, this is a new contact on a new level and not one from which you can compile dictionaries of long words about our abilities." "I do not mean that we will not give you information about our use, but the contact comes when you rise to a level of joy and purity. You must respect us and love us as part of God's life before we can trust you with more secrets about ourselves. Plants are not here just for man's use, but when you learn that man's chief end is to glorify God and enjoy him forever, then we can be part of that enjoyment and glorification, each in our own way, in your consciousness." Each herb, we were told, embodied a particular quality or radiance. As we eat them that quality is enhanced in ourselves. Thus, the wider the range of herbs we eat, the more help they can give us. Gradually we became familiar with all those growing in our garden, mostly by eating them in various combinations in our daily salads. When flowers were introduced into the garden, I found it easiest to contact each deva if the plant was in bloom, for at that time its essence was in fullest manifestation. With certain flowers I felt a natural closeness. The Mesembryanthemum [South African annual or biennial plants having flowers that open only in bright sunlight] Deva, in particular, felt just like a sister to me. Since the petals of this flower unfold only in the sun, this may be the link, because I, too, have a great love for the sun. With others, if I had difficulty feeling any unique characteristics, I sometimes even picked a bloom and kept it in my room for a while until I made its acquaintance. Straining for the contact only created a barrier. "What will come to you will come as on the wings of song, effortlessly," the devas told me. By springtime of our second year at Findhorn, the Landscape Angel told us that our garden was becoming more united and whole, and that as this took place, an angelic being, a sort of guardian angel for our area, was forming. I believe that any unit, whether it be a farm or a community, a couple or a nation, has an overlighting presence that in some way embodies the various levels of energy used within that unit. The Angel of Findhorn is a composite being, "born" from the substance of our thoughts and ideals, the radiations of the land, and the energies of the higher selves of not only the humans working on the land but of all the animals and plants there as well. Each step of its development was described to us by the Landscape Angel. "The being forming here is a new type of deva. This is becoming increasingly apparent. It is gathering life from all of you in a unity with humankind hitherto unknown. You are in a sense part of its body. It will act as a bridge between you and others of my kingdom, and will help you in your work." "At this point it is still nebulous. Although to you it may be slow in growing, it is phenomenally fast compared with others. You cannot feel this new creature yet; nor can we, but we sense it being brought about, Its eyes are still closed, so to speak, its reposeful hands still being defined. Its length is very great. Definite warmth directed to it will speed up the process and quicken its life." A month later, when our garden had been further extended, the Landscape Angel said that the eyes of the new deva were open and that the head had some movement. However, it could not be fully formed until one complete round of plant growth... a year... had passed; otherwise it would not incorporate all the energies necessary for the garden. When at last it was fully formed, the Findhorn Angel presented itself to us: "I take my stand with my brothers, tall and one in essence. Immensely vigorous and vital am I with a role that reaches to the four corners of the Earth and beyond. We all rejoice amongst ourselves in these realms that, with the help of all of you, has been born and grown to fulfillment one such as I, a prototype of cooperative activity. I have been planned from near the Godhead and given sustenance by both the deva and human worlds. Do not form a clear concept of me and keep me in limitation. Now I go from your consciousness, but I am in you and you are in me, different yet one. I am the spirit of a place, yet how much more. You are limited human beings, but you are gods in the making. We are one because we have all been given life." Our cooperation with nature was not only affecting our human world, but the devic realms were also changing through it. The devas exist in the world of the One, without question carrying out the will of God. Because they allow the power to come through them unrestricted, they are, in a sense, more powerful than man. On the other hand, man, living in the world of opposites has freedom of choice and thus the power to create. "We have told you that we are one in essence, that we melt into one another at any time. Whereas that quality has not changed, to it has been added an ability to look at one another, as it were. This brings about a greater sharing, for it is easy to be one if you are not separate! Now our praises can ring higher and deeper, our wonder can mount, in this wider awareness of the forces of life." For us humans, broader awareness comes by recognizing our oneness with all aspects of life. "You consider us beings of light and joy, which we are, but you seldom consider humans as beings of light, which you are. As you encompass all worlds, including ours, when you drop your burdens and become a creature of light, you are one with us." The primary impact on me of the deva world has been this necessity to rise to a higher state within myself in order to contact them. If I am depressed, angry, resentful or caught in some negative emotional state, I cannot enter the light and joyous atmosphere of their realms. "You cannot bring weights into our world, you cannot come to us unless you are free, child-like and light. If you choose, you can live your everyday life in the very same attitude which you bring to us. You know you have to drop your burdens to contact us and therefore you know you can do it. We say, why not do it all the time? It seems strange to keep on the old way when freedom is yours at any time you choose. You love the feel of our life; why not live in it more often?" As I attune to the devas, I partake of their qualities. It is as if they sound a tuning fork that awakens a response within me—their joy and mine become one, and I find I am a joyous being. So every contact with the devas becomes an expansion of my own highest spirit. I have been mainly speaking of the devas as spirits of nature. But they also embody qualities of the human spirit, such as perseverance, tolerance and courage. One of our biggest roles in helping humans is to hold in absolute purity and perfection some quality, so that you may come and be steeped in it and carry its essence within to help you in life's ways. The deva world has always been part of man's highest endeavors, his moments of inspiration and adoration, of wonder and enchantment. What the devas have said to me, wise men have expressed in many ways throughout the ages. This wisdom is the spirit within us calling to us through every part of life, within and without, whether in the song of an angel or the voice of a babbling brook. While the kingdom of the devas exists as a life unto itself, they are also part of us. In fact, to the consciousness that is expanded enough, all things are within. "How can oneness be if you reach outside yourself for it? If God... who is all... is within, can you exclude us? Be sensible. As our consciousness grows, we cannot help but be aware of the devas, for contacting them is basically the same as being in contact with our true selves. We have met before. Whenever anyone contributes attention or feeling to a plant, a bit of that person's being mingles with a bit of our being, and the one world is fostered. You humans are therefore all very linked to us, but until you give recognition to these links, they are as nothing and remain undeveloped. The plants contribute to human food and give of themselves in this way." Open to our influence and let it spread through you." To contact the deva world, an interchange in word or thought is not necessary. Just as everyone responds to a person or a thing according to his or her own particular make-up and perhaps mood at the time, there are infinite levels of communication with the devas. Whenever we are in a state of joy, love, lightness, freedom, we are with the devas. When we are lifted out of ourselves, looking into the beauty of a flower or a sunset or the amazing shape of a shell, this is an experience of the deva world. "Consciousness of beauty brings you into oneness with any part of the universe," they have said. My great love for being outdoors, in touch with the sun, the wind and rain was contact with the devic realms. But only when I had a conscious request from within to contact these beings, did I become aware of their existence. Recognizing their world is most important. This had a tremendous effect on our garden. The devas told us. "Forces work through us into the soil, and extra strength is given them by your consciousness of them. Everything belongs to one world, but if each thing or life lives to itself, it cuts itself off from the one great teeming force field. If each opens out to the all, then currents flow through unhindered. So realize that your recognition of us opens up strength to us and to you, because it lets the forces flow naturally." Considerations we had hitherto thought impractical in the garden, the devas insisted were eminently practical. Our attitudes, thoughts and feelings had a great effect on the plants, they said. Knowing this had a great effect on us, as well, since we had to learn to be careful about how we felt, how we spoke and what we did around the garden. If we were not in a good state, it was best to go elsewhere. We began to realize the truth of what the devas were telling us: "Every creature, human or otherwise, reacts to and acts upon its environment (quite unwittingly sometimes) for all is one." The devas told us that since their purpose was to increase life, they couldn't tell us how to destroy the insects that were eating our plants. However, they said that by visualizing the plants as strong and healthy we could add to their life force and thus help them to withstand the attack. The power of such thought was clearly revealed to me one year when our gooseberry bushes were beset by a plague of caterpillars. Left alone, the insects would have completely stripped off all the young leaves. So I took it upon myself to help out by plucking the little creatures off each bush. This wasn't easy, considering my secret horror of caterpillars. Never before in my life had I even touched one. I would steel myself and spend hours on end collecting caterpillars into a jar, and then deposit them on top of the compost heap where the birds would eat them. It was the best solution I could think of. One day in the middle of this task, I realized that I was so engrossed in the caterpillars that I had forgotten all about the gooseberry bushes themselves. During the rest of that round, I made a point of beaming out thoughts of love and health to the bushes. Next time I went on my rounds, I noticed that those bushes which had received love actually had far fewer caterpillars on them than those which I had not given specific attention to. It was an illuminating experience. A further and more trying test of my faith in the power of thought came during our first year at Findhorn. Because of all the compost we were spreading around the garden, we were beginning to have great luscious earthworms... just what moles like. All around us was sand and gravel, so into our garden the moles came, rooting around in our patio and other areas, leaving the roots of the poor plants hanging in the air, unable to get water or sustenance. Peter came to me and said, "Moles do something about them." Not knowing quite what to do, I decided I might try to use my inner contact. Concentrating on the essence of a mole, I received the impression of a rather scary Great King Mole with a crown on his head sitting in an underground cavern. Feeling rather diffident, I began, "Well, we have a garden and you moles are upsetting it. Can't you do something about it?" I just presented the situation to him fairly, suggesting that they go to a neighboring area of land not being used for gardening. There was nothing more I could do. I gave him my promise that I would not harm him or any of the moles. He just sort of grunted and said, "Hmmmm," and I was left unsure whether this had helped at all. But for several weeks there was no sign of moles in the garden. Each time they reappeared, I repeated my plea to the Mole King. By the end of that season, they had all left the garden and didn't return. However, several years later, when Findhorn was given the neighboring area of land, there they all were, just where we had asked them to go. By then I was no longer working in the garden, but I told the group of gardeners about my experience. Together, using the same technique, they contacted the moles and got an even swifter response than I had received by myself—and the garden remained mole free. This showed me that everyone can use that inner attunement to all aspects of life to work in cooperation with nature, rather than relying on destructive solutions. Despite years of relating to the garden, I never developed into what I would call a real gardener. Therefore, I cannot give a gardener's answers to gardening concerns; I can only give devic answers. Hopefully, as our consciousness expands into greater awareness, these will be the same. In the Findhorn garden, we saw what the cooperation of humans and devas could bring about, each realm contributing a unique and vital energy. But the implications of such cooperation extend far beyond simply growing successful gardens. At a time when it appears that material solutions to ecological crises are not sufficient, perhaps the devas are offering us a real alternative on how to restore the upset balance of nature on our planet. "We know that if humanity could get the feel of our realms, life on Earth would be completely changed." As wielders of energy, they are offering their help in making our world as light and joyful as theirs. But as they have told us again and again, we must play our part, using the power of our free will to direct the energy creatively, both within ourselves and in the world around us. Each one of us can consciously choose to function beyond our current limitations and use the energy he or she has for a larger purpose. And we can find joy and satisfaction in the growing awareness that each one's contribution is of importance, no matter how small it may seem. The key to this transformation lies in recognizing that oneness of all life of which the devas continually remind us. "When you come to us we would not keep you, so to speak, but pass you on in consciousness to the One of whom we are ever conscious, who is our life and the light of the world." This is the basic teaching of the devas, guiding each of us to our inner core, to the divinity within, from which we go out in harmony with all of life. If we can thus transform our way of looking at life, our actions within our environment will be transformed. "Man drastically changes the face of the Earth as it suits him, without a thought that he is dealing with God's life, in various forms. To him it is just shifting matter around. But if he thought of everything in terms of light, all shining with the substance of God, he would not so carelessly alter the Earth." As we begin to recognize God in every aspect of the world around us, that part of the world is redeemed, until ultimately the whole planet is redeemed.We humans are supremely gifted. We can encompass the entire range of life on our planet,and it is our destiny to do so. We begin by becoming more and more of what we are, more of what the devas are. "We have often expressed to you our great joy as you turn to our kingdom, and we have come flocking with our power and bestowed much on your garden. We would pour down on you all, activating what you already have within, some characteristics of the angelic world: our abounding joy, our lightness, our vitality, our freedom, our flexibility. We could go on and on, for there is no end to God's gifts to his creation. In all this we are one, without separation. Let us extend that oneness to all levels, and let us do it here and now." Every plant does have a unique ensouling presence. These messages, however, have not been communicated by individual plants but rather by the overlighting intelligence and spirit... the deva... for each plant species. While the devas themselves are beyond form, yet are they responsible for the most precise and minute forms we behold in the plant kingdom, the wonderful exactness of each seed and leaf and blossom. This they do in joy and lightness, as the great servers of life. The process by which I contact the devas is one of feeling into the essence of a plant and harmonizing my own self with it. The communication doesn't come to me as words, but as thoughts of inspiration, which I then express in words according to my own state of consciousness at the time. If I were to receive the same communication now, I probably would not word it in the same way, for my consciousness, as is only natural, has grown into a deeper understanding and awareness. Because each garden is unique, the devas did not give general rules of action. As they told me, Humans know most of these from the traditions of gardening. It is in the field of conscious-sharing that something new is to be learned. Moreover, they wanted us to find out for ourselves what it is that we as humans are capable of doing. We have all knowledge within ourselves, they have said, and they would point us toward that. To me, one of the most significant aspects of contact with the devas is simply that it helps to enlarge our viewpoint. If we treat everything as alive, intelligent and part of the One Life, our own life is greatly enriched. When we realize that we are in a sea of life with which we can communicate, there is bound to be cooperation between mankind and nature. As we grow to understand that the key to contacting the devic realms is to seek within, to be what we truly are, we will discover that the devas are a part of our very selves. Wow, thank you SO much for posting that last article Mudra. They truly are inspirational aren't they? They just makes my heart glow. Interesting. I just asked E which densities they work in and she replied "second, third and fourth" and that they work with the etheric energies. "We abound in you, around you, everywhere, in all dimensions." And she added that they have never lost touch with the higher dimensions like we have. This month we are exploring Nature spirits and the Elemental Kingdom. In May we discussed the Devic Kingdom and nature spirits that comprise the M.A.P. healing teams. This will explore further more of the hierarchies that exist in these realms. Last week I met a new friend that is a medical intuitive and she does similar healing work as I do. She described to me as a child listening to the orchestral movements of nature, how the blades of grass would sing to her, how the trees moved in beautiful melodies and that walking outside was like sitting in the middle of a beautiful Symphony. This inspired me to write in more detail about the nature spirits and elementals. Most of us humans have been disconnected from sensing this exquisite level of reality, one that is teaming with consciousness, life and beauty. The Earth and her kingdom’s are very much alive and interconnected with all life forms and human beings. They are very much impacted by humanities evolution and all are simultaneously evolving with us. There are many types of Devas both working at subhuman and superhuman levels. Each group of Devas has specific work and methods to attain their goals and evolutionary purposes. The evolution of Devas is speeding up in synchronization with evolution of the human family. As humans learn to work more closely with the Devic evolution, they will learn how to heal and control their etheric bodies to a greater degree. They hold the patterns that underlie all living and growing things on the planet. That includes the mineral, plants, and animal kingdom's as well as the elements of fire, air, earth and water. Human bodies are governed by nature spirits where they are the spiritual equivalent of the cell, organisms and microorganisms that work together to make organs, tissues and glands function properly. Devas and nature spirits must be distinguished from each other. Devas are the architects that guide forces to give form, structure and energy to the plant world. They carry the archetypal patterns for each of the material forms. The nature spirits actually do the work of building the plants. They channel the etheric forces they receive into physically constructing the particular plant patterns they are receiving from the Deva. Nature spirits are like the physical workers who carry out the architects blueprint. They vary in size from an inch to three or 4 ft. tall; the nature spirits are mostly composed of the etheric matter. Very few people on the planet have been able to fully visualize them. Most of the written account of detailed communication with nature spirits has been documented by a spiritual community in Scotland called Findhorn. Quite a few of the well known spiritual leaders and metaphysical speakers, such as Caroline Myss, have spent time there. Have you ever stopped to think what causes a flower or plant to bloom or how it has a certain color or a certain fragrance? There is a level of consciousness of tiny etheric beings who work to manifest these qualities. Apparently the plant kingdom on planet Earth is one of the most advanced in this galaxy. We have an amazing array of nature spirits and elementals in very complex formation to provide so many variations of flora fauna, that we as humans get to experience. Within each of the four elements are nature spirits that are the spiritual essence of the element. Nature spirits of earth are called Gnomes. The nature spirits of water are called Undines. The nature spirits of fire are called Salamanders. The nature spirits of air are called Sylphs. These beings are made up of etheric substance that is unique and specific to their particular element. They are living entities inhabiting worlds of their own. They have the power to change size and appearance at will. They cannot however change the foundational law or characteristic of the element they work with, nor work in another element realm. The atmosphere that humanity has created is poisonous and toxic to the nature spirits. As humanity became industrialized we destroyed much of nature in its natural abundance. Many of the nature spirits withdrew into areas of seclusion or left entirely. Slowly humanity is waking up to the fact that the world we created is not only poisonous to nature but to ourselves as well. As we transition into this New Energy, new alternatives to environmentally benign products and ways to work in harmony with nature will become apparent and necessary. The ecological and sustainable freedom movement is already beginning a trend in our transition as it is now become an economical imperative. The ultimate spiritual maturity of humanity is to take responsible environmental action and take all kingdoms of earth into our awareness, working in conscious cooperation with these nature kingdoms. It is time for these evolutions to work in mutual love, trust and cooperation. There are many kinds of Gnomes, each working with a particular part of the Earth, such as the mineral and gem kingdom's. It is interesting that gnomes have been a part of collective humanities supposed mythology, whereas we can go to the garden supply store or Home Depot and get one of those red hat plaster gnomes for the garden. Little did we know the truth in that reality! Gnomes work with a hierarchy of minerals and gemstones. People have a hard time realizing that minerals are alive. The signature of life in the mineral kingdom is the crystal formation the Gnome has created. In reality the mineral kingdom is most important to life. It makes up the crust of the earth upon which humans and animals live. The mineral kingdom provides the basic source of nutrients in that plants are rooted in the mineral soil, plants then nourish the physical bodies of humans and animals, animals then being a food source for humans as well. Without the mineral kingdom, the plant, animal and human kingdom could not survive. The Undines are the elementals that compose water. Etheric in nature they exist within the water itself and why they cannot be seen with normal physical vision. It has been interesting to see recently the popularity of the body of work by Dr. Masuro Emoto with his book, The Hidden Messages of Water. Dr. Masuro has gained international notoriety for his groundbreaking work regarding the effect of words/thoughts and feelings on the water and it's crystallized forms. He discovered that crystals formed in frozen water change when specific thoughts are directed towards them. Dr. Masuro has stated he believes water is the messenger of God and that he has further documented this in his research scientifically. Clearly water is only one of the many “ messenger's” of God, it just so happens one human being was able to find a way to physically document the impact human thoughts and words have upon another life form, such as water. In the near future we will further our scientific research to find more discoveries within our world, and nature, that it is teaming with conscious awareness and fully responds to human interaction. This begins the era of humanities new awareness of the responsibilities of our impact with all living creatures and the realization that many of these life forms are under our care as the stewards of this planet. The Salamanders are the spirits of fire. Fire would not exist without these beings present. Some people have seen them as small balls of light, usually they are perceived in a lizard-like shape. Salamanders have the ability to extend their size or diminish it. If you ever need to light a campfire in the wilderness, call to the salamanders and they will help you! They are greatly affected, as with all nature spirits, by human thinking and thought forms. Inharmonious conditions in a home or area can cause these beings to act. They are like children in that they don't fully understand the result of their action. Many of the indigenous cultures considered fire the strongest and most powerful of all elements. Fire and flame is greatly purifying and powerful for those who use fire in a ritual setting. We have lit candles in memory of others, to evoke powers in our self, to call upon the saints, as offerings to the gods. Fire amplifies the power of our own intention when focused upon. Always use fire with the highest intention for the highest good. The Sylphs are air spirits. Their element has the highest vibration rate of the four elements. They are volatile and changeable, the wind is their particular vehicle. They work through the gasses and ethers of the stratospheres of Earth. The air spirits are associated with mental aspects, one of their functions is to help humans receive inspiration. The Sylphs are drawn to those using their minds in the creative arts. They can be called upon for creative inspiration in this way. There are other types of elementals that are different from the ones described above. They are created by thought forms from elemental essence. They are one of the reasons it is so important for humans to control their negative thoughts. Negative thoughts such as fear, violence or sadness create these little beings which are called astral elementals. They get lodged and create energetic blocks in the human aura or Energy Field. It is important that human beings refrain from the manipulation of these elemental forces until self mastery and consciousness of the soul has attained a certain level. If a person has a victim consciousness, he or she is easily manipulated by these elementals of lower order and vibration. One way to create negative elementals is to drink too much alcohol, or take drugs or be in prolonged negative emotion states. The buildup of these toxic thoughts and substances weaken the energetic field, and eventually created imbalance in the bodies that lead to disease. Despite our best efforts, just the process of living upon this planet we are exposed to many negative influences. There are many ways to clear them from your Energy Field. It just takes awareness, intention and focus. Call-in St. Germain, those that serve the violet purple transmuting flame, ask your body be purified through every cell, pore of your Energy matrix system. Clear away all dross, debris and negative elementals through the purity of the violet fire. Request to be taken to the synthesis ashram on the inner plane and be cleared of all negative elemental imprints or thought forms. This is a good request to invocate before bedtime. Surround yourself with a platinum silver net, use it as a filter through all of your bodies. Command the clearing of all misqualified or imbalanced energies, clear all negative and thought forms and elementals. Call upon any spiritual figure or master you feel connected to. Ask for assistance, especially when confronted with any form of negativity. Asked to be guarded against negative elemental thought forms with a perfect shield of divine protection. Visualize that shield as an impenetrable wall from any negativity. If you're having any health challenges with a nonspecific body part or internal organ, you can ask the elementals to “live”within that organ, within the tissue, and work to repair and restore the organ to its perfect representation of the divine blueprint. Ask your healing angels to send the elementals to the organ and tissue you need to repaired. Give them permission to live inside your organ to heal it fully, completely and totally. It is best to work in co-creation and focus with the elementals on visualizing your body part completely restored and full of healing light, a least the first few times when making your request. As long as it's in harmony, they may stay there for as long as necessary. You may feel them as these tiny little assembly-line workers, you can feel the activity and the buzzing energy of it. It reminds me of the sound of a hummingbird or bumblebee buzzing. You can perceive the tiny-ness, yet profound quality of the interaction as you hone your ability to perceive these energies. Sitting or sleeping directly on the ground, walking barefoot, gardening, camping, hiking, anything that allows you to see, hear, especially feel, the Earth. While doing any of these things, focus on bonding, and becoming one with the Earth Mother. Attempt a regular interaction with nature as its very healing and supportive for us. We will continue to explore more of the “Spirit Hierarchy” next month. Stay in the luminosity of your heart and soul path! We are here as ONE! The American herbal practitioner, Jethro Kloss, in his monumental work "Back to Eden," aptly describes Sanicle in this manner: "This is one of the herbs that could be called a cure-all, because it possesses powerful cleansing and healing virtues both internally and externally." Sanicle's great strength includes its uncanny ability to seek out and find anything which needs correcting and works on that area first which needs it most. It also deserves distinction as a "thinking herb." 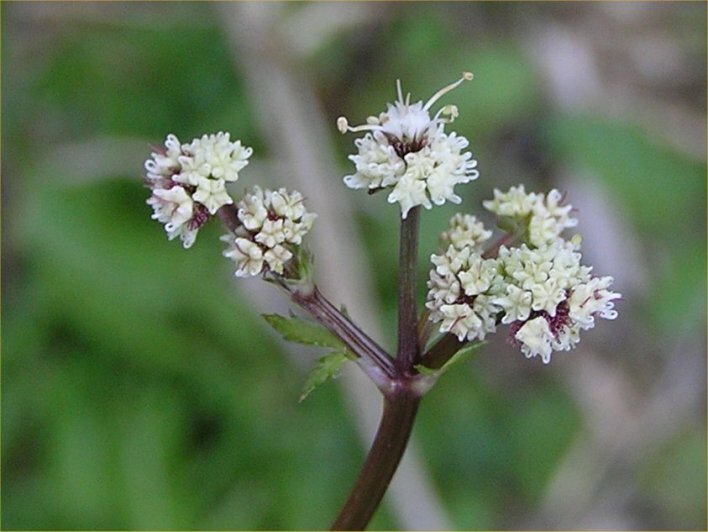 In other words, if you've got it, Sanicle will find it and fix it, whether it is in the reproductive organs, brain, nervous system, lungs, throat, urinary system or elsewhere. Sanicle is a bulldozer and builder. There may be temporary discomfort when Sanicle contacts an unwanted obstruction, but it is your reassurance that Sanicle has scored a direct hit. Skin disorders, tumors (also brain tumors), and all manner of morbid material are resolved by Sanicle. Prolapsis of the uterus (fallen uterus), melancholy (due to toxins), thin mother's milk, morning sickness, diabetes, bee stings, and intermittent fever indicate general categories of its ubiquitous (seemingly everywhere) application. Haha, thanks SiriArc. That was an awesome 'dictionary dip' I did indeed. "Any umbelliferous plant of the genus Sanicula, of most regions except Australia, having clusters of small white flowers and oval fruits with hooked bristles, formerly thought to have healing powers." It seemed appropriate at the time, seeming to be a plain and unobtrusive wildflower, which I related to, and, at the time, I was no longer doing the healing. So there you go. I thoroughly enjoyed reading the descriptions given of the Elementals and Nature Spirits given by the clairvoyants Tompkins covers in this book. Interesting also that he says these beings take their 'form' out of the minds of those who may view them. E confirmed this as so. Explains a lot. I also enjoyed the chapter that describes how the Freemasons call on the Elementals to join and assist them when they perform their initiations (Page 170). Interesting also that Astralwalker, in his book, called on the Elementals to assist him activate his kundilini. A quote from that site:- "As actual proof, the outer space exposed to sun rays without any blockage from atmosphere is really extremely cold to approximately 3 oK (-273 oC), water freezes approximately at 4 oC. Why is it not then extremely hot, since when sun is resplendent, in summer for instance, and there are no clouds is hot outdoors? Heat is caused by a thermal reaction between sun rays and the electromagnetic planetary aura, the Van Allen lines or the morphogenetic fields of matter as taught in ancient arcane wisdom (1) and in the book Telos (2)"
In E's words* when I was talking to her about being connected to God Source:-"Not the same energy, believe me. He cold. He One. Two knows love. The love of our Mother is stronger, much stronger. She love true in heart. Heat. We feel it here, all around us, keeping us warm. Not 'Sun love'. Earth love. She reflects, feeds us Her love. From him...sort of...but not the same. Not what you all think. It different, Sun heat. You wrong about that. Is Her in our hearts emanating heat for you, always. Is wrong is God." "He Father. He ruler. He strong and sure and makes patterns for us to fit. But He not know you and love you like we do, like She does. He care for you but we love you more, for Her. Our cherished one, our Mother Earth of Love. Is heat! You'll see. God will show. He knows too. Is love, Her love He wants. ..........."You need know this. ALL need know this. Is wrong for Her. Take Her for granted." *Or rather the words I hear as my mind interprets her projections to me. This post is in reference to the second last post #96 in which I stated that E claimed the Sun is cold. I've been doing further research on this and have found quite a lot of information to back up her statement. In fact I've read that even Nicolas Tesla had this belief. Plasma Cosmology, based on the belief that the Sun is electric rather than nuclear, seems to be the current theme under discussion to disprove the general belief that the Sun is a nuclear furnace that heats our planet, not that is the reaction between the solar rays and our atmosphere and the nuclear reaction within our Earth to the rays that creates the heat we enjoy. Anyway, here's a fascinating video that explains the basis of Plasma Cosmology, refuting the 'nuclear furnace' theory. And here's a link to the website I found that gives further explanations. It includes videos many of us have seen of large spacecraft within the Sun's corona that were NOT burned up. There's a lot of fascinating info on this site, well worth a read. Below is an image giving an approximation of how Mother Earth and the atmosphere work together to deal with the heat coming from the Sun. And here's a link that gives an explanation of how Mother Earth generates her own heat. Googling kamLAND will also reveal some interesting new research on that latter as well. I've just been listening to yet another version of Earth's history. There are so many now it's hard to know what to believe. So I asked E about it. Here's the gist of what she ended up saying. As for me and what I hear from E, I much prefer to listen to her and any of her kindred as they have been here watching over all that's occurred on this planet for thousands of years as beings of energy who can move in and out of form at will. They don't have the limited perceptions we do and have no reason to manipulate our beliefs. I actually saw a very talented psychic on Friday, one who was able to describe all of those closest to me with great precision. She described E as a being who is “just love” and very gentle. But also very powerful at a planetary and interplanetary level. And yet she always speaks in a very down-to-earth manner to me and her answers always elicit an “of course” response, whether the questions that come into my mind are of a Universal nature or just day-to day stuff. She even answers questions for loved ones around me as the thoughts form in their minds, before they even vocalise them. She is more like a sister than my own sister. I love her dearly and would recommend to EVERYONE that they try to make contact with these wonderful Earth Spirits/Elementals if they just want to know the basic facts. One final saying of hers that I just love is in relation to death. It is, “In or out, it doesn't matter. You are still the same.” And, in harmony with that, that the life and death aspect of this planet is just all about “re-cycling”. I thank God for the gift of knowing her every day. She really is like the calm voice of reason in this ever more crazy world we live in. I figured it was time I gave the reason I haven't added any more to this thread for some time for the discernment of any who may have been following it. One of the reasons is because my Mother became ill with cancer and I was busy taking care of her and not visiting the forum much. She has since passed over (29/9/11). Actually I will recount an interesting situation that occurred before she did so involving E that I did record in my own journal for any who may be interested. It's to do with the cancer and I'll just precis what I wrote in my journal on 10/8/11. I'd checked on my Mum before I went to bed and was shocked to see a large, shadowy, black 'globby' shape at the foot of her bed. When I spotted it it zipped around to the side of the bed where I couldn't see it. There was also a bad smell in the room. When I was wondering if I should try to do something about it, if it was a dark energy attacking Mum, E's voice came into my mind telling me, "No, it's helping her," referring to it as the "cancer bug". She went on to explain that it's a lower type of undine energy that deals with cancer, actually sucking the "poisoned emotions", as E called them, out of the body. She added that while the patient sleeps the bug "tries harder" as it can get more work done while the Spirit is out of the body and the bad smell is most often noticed when the undines are working, drawing the bad energy out into the open. It grows as it 'eats', taking the water back to clean and recycle it. Guess that's why cancer patients get so skinny. One final note for this post re this type of undine energy which is that they are obviously different to the usual type of undine that work in the waters of the planet, E saying these one's specific role is "to work with human offal" (offal: 2. dead or decomposing organic matter - Collins Dictionary). Where would we be without them and others of their ilk who work on animals, etc. to drain the fluid out of corrupted flesh generally? Her explanations made me realise just how great is the expanse of work the Elementals do on this planet on so many different levels that we are unaware of and that goes unappreciated.